TweetMeme extension just made Retweeting from Chrome even easier. Y’ever been browsing around, looking at something that you know your Twitter followers would love, but just couldn’t be bothered to go back to your Twitter application to tweet it? Or, let’s face it, everybody loves an easier way to do things. The TweetMeme extension for Google Chrome just made life a little bit easier. TweetMeme buttons are all over the Internet. Heck, we even love them here at TNW. In fact, we’re just one of 175,000 websites that feature them. So now you can install the extension and have your own TweetMeme Retweet button right next to the Omnibar. 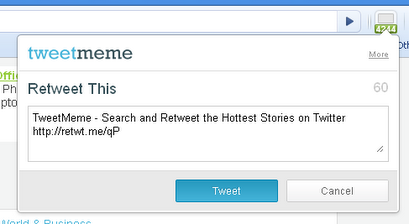 So head over to the Google Chrome Extensions page and snag yourself some TweetMeme goodness.